Each living thing is called an organism – from an ant to a blue whale. Organisms that are alike, with the same physical appearance, behavior, and genetic make up are considered to be the same species. No one knows how many species there are on Earth. There could be as many as 15 million species. We have only identified and named about 1.5 million species so far. Most of the species we have identified are insects. Many organisms of one species together are called a population. Not all the individuals in a population are exactly the same though. In a herd of caribou or a flock of birds there are some that look or act a little differently from one another. This is called genetic diversity. Think how differently you look from your sister or brother or the kid down the street. Where a population of species lives is called its habitat. A habitat can be just a ditch full of water or a vast forest. Where a species lives throughout the world is called its range. Some species, like the brown rat, are found all over the world, while others, like the kiwi, may only be found on one island. 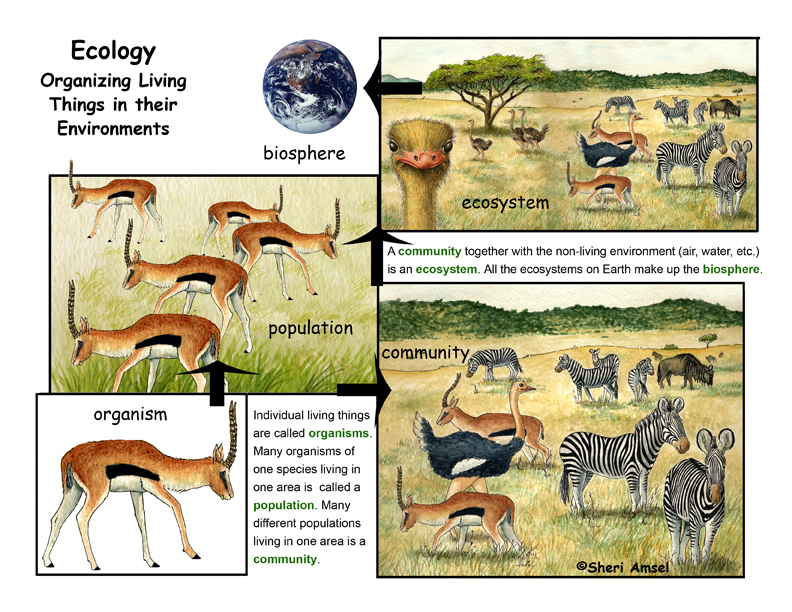 Many different populations of species living in one area and interacting, like a herd of deer grazing on a meadow of grass, is called a community. A community together with all the non-living (abiotic) things around, like rocks, water, sun and air, is called the ecosystem. An ecosystem, like a habitat, can be as small as a ditch or as big as a forest. However, a habitat is really where an organism lives, while an ecosystem is what it does.